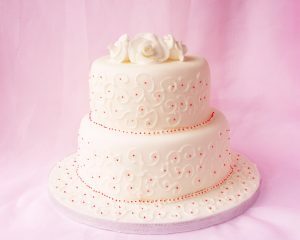 Although the tradition of the wedding cake has been around since medieval times, the modern wedding cake didn’t appear until 1882 at the wedding of Prince Leopold, Duke of Albany. In ancient Rome, the cake—which was actually bread—was crumbled over the head of the bride and groom for good fortune. Luckily, we’ve come a long way since then! The cake for Prince Leopold’s wedding was the first to be completely edible and featured the tiers that we are familiar with today. But what if you don’t want a traditional wedding cake? We have a few fun “out-of-the-box” ideas for you! Hate cake and love pie? 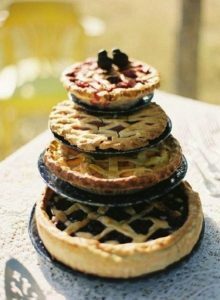 How about a Pie Cake! Pie has certainly grown in popularity over the years, possibly soon outdistancing cupcakes, and this proves it’s versatile enough to serve as a wedding cake. Bonus? It stacks easily into tiers, and everyone gets to try their favorite flavor! Can you imagine wearing your wedding cake as a dress? Well, we found one! I’m not sure how many brides feel the need to be this intimately involved in their wedding, so luckily enigmatic Icelandic artist Lukka Sigurdardottir created this dress as art rather clothing intended to be worn. But it’s still an interesting idea! For the anti-sweets couple, it’s possible to avoid pastry altogether. This unusual “cake” proves that wedding celebrations can include anything the happy couple love, including hamburgers! From the Tumblr Fat & Furious by artists Thomas & Quentin, this cake is also more art than food, but definitely provides some inspiration! Why would anybody ever eat anything besides breakfast food? That is a great question, Leslie! Brunch wedding receptions are not only less expensive, they feature the best food in the world: breakfast food! 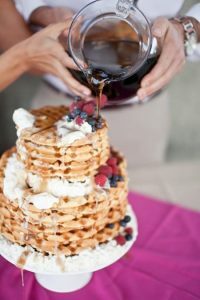 This waffle wedding cake fits the bill both ways. It’s an awesome and unique wedding cake, plus it looks absolutely delicious! Your wedding cake is the centerpiece of the reception. As long as it is tasty and personalized, it will be memorable for you! Did you have an amazing and unusual cake at your wedding? Post it to our Facebook so we can all see!